In the third installment of his miniseries, the Bible in English, Las Vegas bookseller Greg Hicks examines more of the translations that matter. A couple of decades elapsed before the next important English Bible was published. This edition turned out to be as controversial as it was popular. It is commonly known as the Geneva Bible, and was first issued in 1560. Why the controversy? The translation (directly from the Hebrew and Greek) was done by a group of Protestant Reformers who fled to Geneva (at that time administered by John Calvin) with the accession of Queen Mary in the 1550’s. The lesson of John Rogers wasn’t lost on them. As a result of their radical religious proclivities the translation was deliberately provocative, not only to the Catholic Church, but to mainstream Anglicanism as well. This emerged not only in the translation, but in the abundant marginal notes, which expressed a stridently Puritanical point of view. In a couple of instances the notes even offended the monarchy itself. For example, in II Chronicles it is recorded that Asa deposed his mother, the queen, for setting up an idol for purposes of worship. The marginal note reads, “Herein he showed that he lacked zeal, for she ought to have died.” This is a deliberately incendiary note, explicitly advocating regicide when the principles of religion justify it. However, the Geneva version struck a deep chord with radical reformers, and became immensely popular for a century or so. It was the translation read by Shakespeare and Bunyan, and brought to America by the early English colonists. With the exception of the King James Version, this is the most important English-language Bible ever produced. The controversy that swirled around it further attests to the high drama of Bible translation in 16th and 17th century England. What was at stake was nothing less than the very definition of Christianity itself. Gothic text edition of the Geneva (or “Breeches”) Bible. In order to counter the popularity of the Geneva Bible the mainstream Anglican Church, spearheaded by Matthew Parker, Archbishop of Canterbury, undertook a fresh translation. The result was the Bishop’s Bible of 1568, so called because the translation was assigned to eight Anglican Bishops, who each worked on a “parcel” of the Bible. In addition to some very astute Greek-to-English translations, the Great Bible is widely admired for the sumptuousness of its typography and illustrations. It is one of the most beautiful folio (large format) English Bibles ever produced. Perhaps its most important feature is that it was used as the starting point for the King James Version, the crowning achievement of English Bible translation. 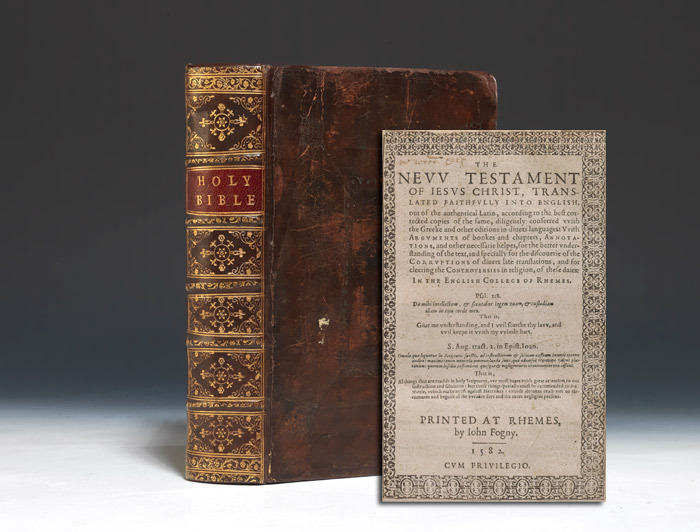 First edition of Fulke’s parallel presentation of the Rheims New Testament and the Bishops’ Bible. As English-language Bibles continued to proliferate throughout the 16th century the Catholic Church recognized the need for a translation of its own, if it wished to keep believers in the fold. The result was the Rhemes New Testament, published in 1582. The chief translator was Gregory Martin, a highly accomplished scholar, who translated directly from the Latin Vulgate. While the reformers saw this as a step backwards from translations based on the original, uncorrupted Hebrew and Greek, many of Martin’s phrases have a beauty and power which was not lost on the scholars who produced the King James Bible. While they couldn’t openly acknowledge their use of a Catholic translation, they covertly consulted it and in many instances utilized its wording verbatim. 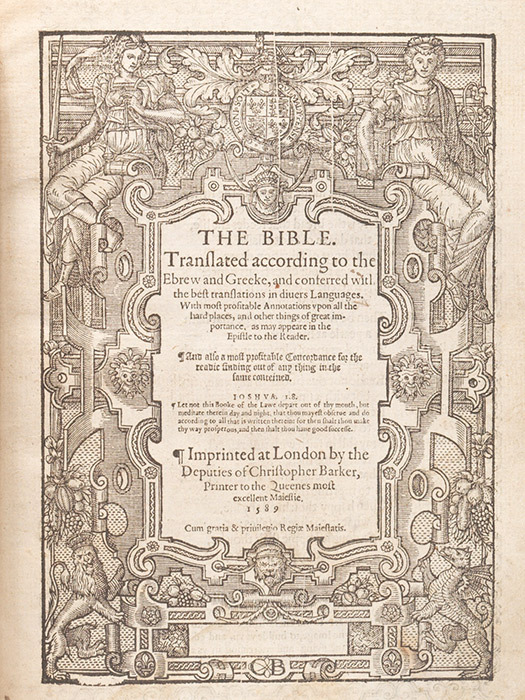 A Catholic translation of the Old Testament, known as the Douai Old Testament, was produced much later, in 1609-10, just before the King James Version was issued. Very scarce first edition of the important Rheims New Testament, the first Roman Catholic version in English, translated from the Vulgate. 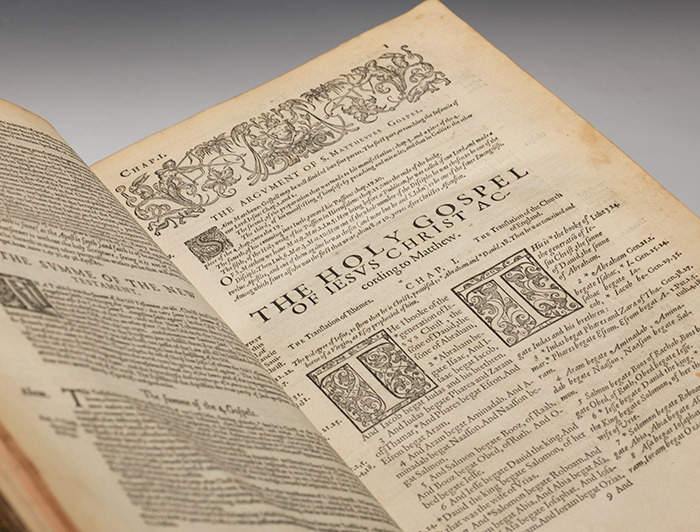 Like a flower coming into full bloom, the long tradition of English Bible translation culminated in the King James Version of 1611. Soon after James I came to power he convened the Hampton Court Conference to resolve internal differences within the Church of England. At one point a Puritan leader, John Rainolds, requested that “the Bible now be translated, such as are extant not answering to the original.” Anxious to produce a “Bible for all Englishmen,” James I agreed. However, he wasn’t content to produce yet another version of the Bible, similar in kind to the translations that preceded it. 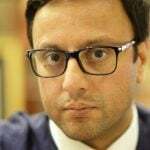 He organized this new project as a massive undertaking, unlike anything which had been attempted before. Forty-seven of the finest scholars from the churches and universities of England were selected to participate. They were broken up into six companies. All the men in a company would work on the same chapter, then meet to compare, revise, and harmonize their drafts. When they had completed an entire book of the Bible in this way they handed their work over to the other companies for criticism and revision. Finally, after all the companies had completed their work, a separate committee of six met daily for nine months to complete and finalize the revisions. The various translators who worked on the King James Version utilized the best available sources every step of the way. Taking the Bishop’s Bible as their starting point, they utilized Greek and Hebrew manuscripts, as well as all of the previous English-language translations from Tyndale onward. Of the work Tyndale completed, about eighty-five percent was incorporated into the King James Version. However, all of the preceding English translations contributed in varying degrees to the final version. The results were monumental. The King James translators did, indeed, create “a Bible for all Englishmen.” They removed the most contentious words and phrases from the Geveva version (in both the translation and marginal notes), and substituted more traditional usages for them. The depth of scholarship that underlies the translation is hardly surprising, given the credentials of the scholars who worked on the project. What is surprising is that a group of forty-seven translators produced one of the finest prose works in English, and one of the glories of world literature. 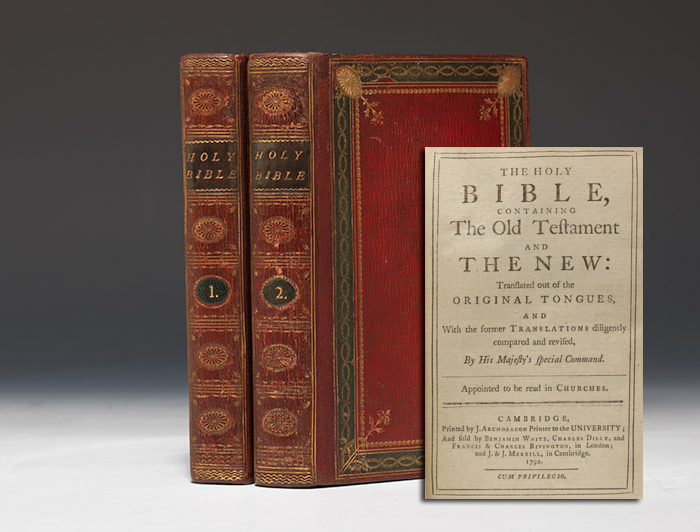 As a result, the King James Version has been immensely popular for over 400 years. Its effects on literature, theology, and the texture of Christian piety over the last four centuries have been incalculable. Handsomely bound 1792 Cambridge edition of the venerable King James Bible. Next week in the final part of this miniseries, Greg offers advice and inspiration for collecting Bibles. Thanks so much for this series of articles. Very informative!